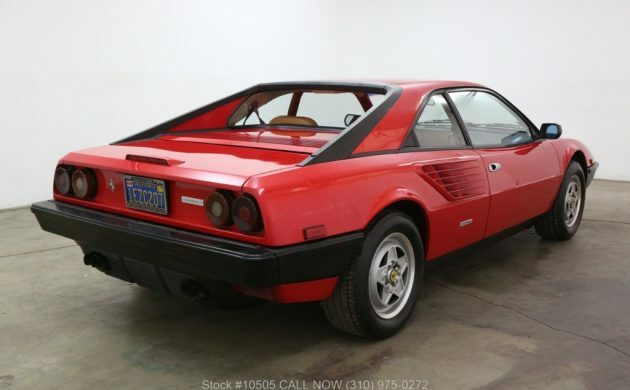 For those with a desire to own an Italian thoroughbred, the Mondial remains one of the most affordable of the Ferraris. It is not everyone’s favorite vehicle built by the prancing horse, but with 6,000 cars produced during its model run, it was the highest selling Ferrari up to that point in the maker’s history. This Mondial appears to be in fairly decent condition, is located in Los Angeles, California, and is listed for sale here on eBay. There are definitely people who find the concept of a 4-seater Ferrari to be a bit odd, and I must say that I was one of those people. However, the high sales figures meant that throughout the 1980s and early 1990s, the Mondial was the most commonly seen Ferrari on our roads. The condition of this one looks generally quite good, with the Rosso Corsa paint having a nice shine to it. Some of the external plastic is beginning to show its age slightly, and this is particularly obvious on the tail-light lenses, which have begun to develop a distinctly matte appearance. The engine and transmission of any Ferrari is an engineering triumph, and the Mondial is no exception. 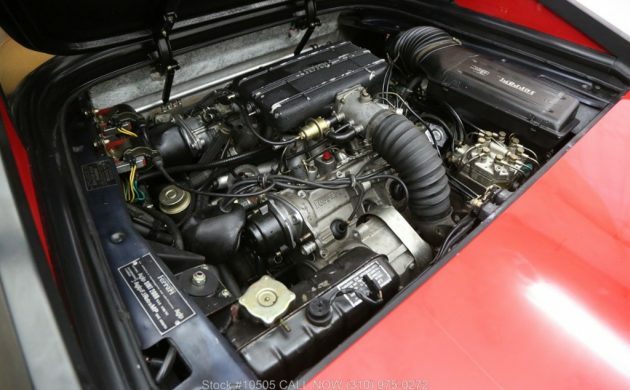 The mid-engined vehicle design doesn’t leave a lot of room to spare for the engine itself, and Ferrari managed to squeeze a transversely mounted 2,926cc V8 engine in there, mated to a 5-speed manual transaxle. This engine produces 205hp in the American market and gave the car a top speed of 137mph. 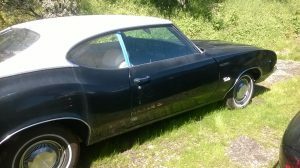 It is also considered to be one of the more practical designs, as the engine and transaxle do not have to be removed from the vehicle for major servicing. One of the interesting facts to consider with the Mondial is the relative rarity of certain variations. While there were close to 6,000 Mondials built in total, examples like this American delivered left-hand drive Mondial 8 accounted for only 147 cars delivered across the US and Canada. Italian manufacturers have developed something of a bad reputation when it comes to the science of ergonomics in interior design. Some of this is justified, while some of it isn’t. The early Mondials had one feature that defied logic, and it was also heavily criticized in many new car reviews. The factory radio/cassette player was located in the floor console in such a position that it was extremely difficult for the driver to see the controls. This was rectified in later models, but this car has that feature. Still, who wants to listen to music when you have that wonderful little V8 singing away just behind you. 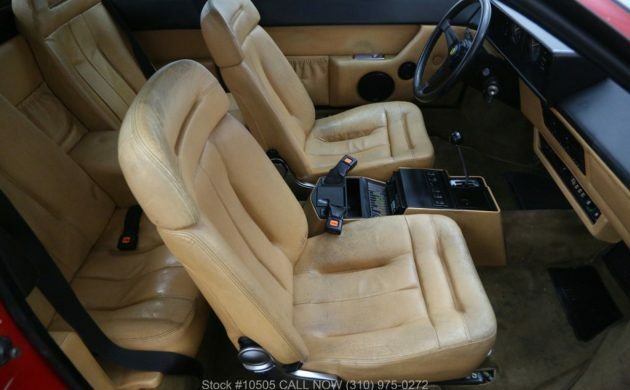 The leather interior and trim all seems to be intact, although the leather on the seats is starting to show some wear. However, a good upholsterer should be able to restore the existing leather at a reasonable price. One feature that I do love is the gated gear shifter, That has to be one of the coolest looking things ever fitted to a car. 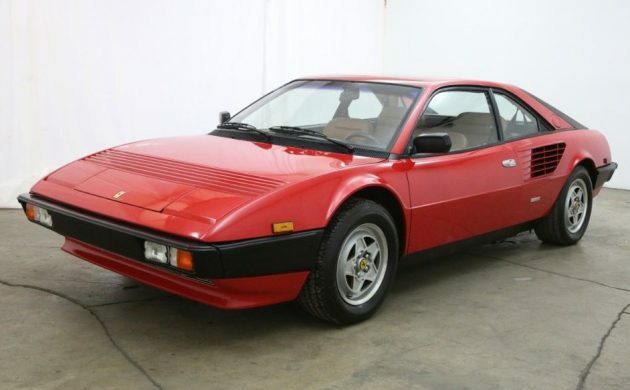 The Mondial is not the prettiest Ferrari ever built, nor is it the fastest. It is one of the most practical, and also one of the easiest and cheapest to maintain. Of course, cheap maintenance is a relative thing when it comes to cars like this. While they have been criticized for their styling, they still sell fairly well. 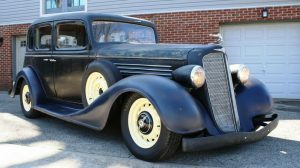 Prices have remained quite stable and affordable, and it is possible to find really nice examples for around the $25,000 mark. This one appears to need a few very minor detail items restored, but there doesn’t appear to be anything major. 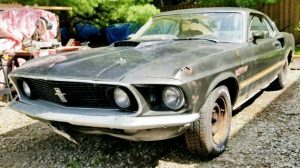 The owner has set a BIN price of $19,950, but the option is there to make an offer. Compared to what is available at the moment, that price seems to be quite reasonable. That would be the unmistakable cracked concrete floor and white curtain background of the famous Alex Manos of Beverly Hills Car Club fame. Located not in the Hills of Beverly but rather in more mundane East Los Angeles, Alex sells distressed classics of questionable provenance to dreamers who think their going to get a deal on an exotic that “just needs a little elbow-grease”. To his credit, he bailed me out of a pig of a 912 for what I paid for it; and sold it for $10k more. Smart man, Alex. No such thing as an “affordable” Ferrari. Not everyone can afford a Testarossa or F40. It ain’t that bad. Almost no one can afford a Test or F40……………………..and yes if I had 20 large to burn and no expectations that it would not blow up fairly soon…I’d buy it just to have owned a Ferrari. Though it couldn’t be farther from the kind of wheels I favor….but then life is brutally short. You have no idea how expensive it is to drive n service that car once it needs anything !!!! Not true. I own one and it has been reliable. Long term owners report about the same running costs as a 80’s BMW. I’d buy it, but everyone would think you are driving a Magnum P.I. kit car. All I have todo is see that floor, and RUN AWAY!!!! it may look good, but I’d be really really scared. Wherein earth he gets the things he gets, I have NO idea. In the days when I had a classic car sales company I had to call on a customer who was thinking about buying a Mondial. He lived about 20 miles way up in the mountains via a very twisty, narrow road. After I had shown him the Mondial and he had taken it for a test drive, he asked me what other similar sports coupe I had for sale. I told him the only similar vehicle I had at the time was a BMW 635 CSI which he said he would like to test drive. The next day I drove the 635 up the mountain and decided that if I were a buyer I would take the BMW in preference to the Mondial. That’s exactly as it turned out and he became the proud owner of the Beemer. Having worked for a shady wholesaler back in the 80’s, I once got to drive one of these from Mannhem, PA back to Buffalo. Thoroughly unimpressed. I’d take that 635 over the Mondial any day. 4 seater? Really? I just saw a Ferrari that looked like a Station Wagon with Dealer plates on it this morning as I was leaving work. It was gun metal grey and Brand New. I guess the World has gone full circle and Ferrari is making 4 seaters again? It definitely looked like a “shooting brake”? or more commonly as a Station Wagon. Epic combination of Far and Away the worst model to ever wear a Ferrari badge being offered for sale by the lowest form of human life on this planet. Is there a barf emoji worthy of this combo? Besides the looks the biggest problem with these is performing standard upkeep. Look hard at that engine bay and notice how difficult the front plugs are to get to. There are a host of other items that are just as problematic. The 308 GTB’s had many improvements and are a more reasonable job. So many buy older exotics thinking that they are simpler to keep on the road. These are not. I wouldn’t even crank it over until I knew the condition of the cam belts and tensioner rollers. Expect an instant $5k service and “while we’re in there” $5k more, up to $15-$20k. Unless you work on cars like this, as I do, it’s just the reality of owning a Ferrari. Nothing to worry about – LMAO! About 10 years back i saw a Mondial for sale at the local Wheels and Deals consignment store in Nor Cal. It was marked down to $11k. And still i hesitated because after all its a Mondial! Nowdays theres a company that strips the suspension and drivetrain to use in a redo of the Lancia Stratos. Now thats a good use for this car! Im totally with PRA4SNW Watch out for those guys a BHCC total crooks and are known for sell junk!!! I have owned my Mondial Coupe for 6 months now, so thought I would chime in and share my experience. First, reliability. 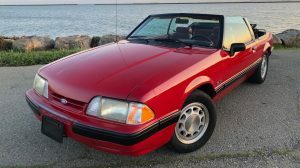 I collected mine from San Francisco and drove it home to Connecticut. It took 3500 miles and 8 days, and the car performed flawlessly. The only glitches were deformed tires in Nevada (115F on Highway 6), and loose solder on a headlight switch stalk that required a 5 minute fix – thanks to the FerrarChat forum – great supportive group of people. Second, the fun. I have owned some fun cars, a 944, Renault Gordini, Supercharged MR2, and an Audi Quattro with a chip, so that’s my baseline. The Mondial is nothing like those cars. Nothing. Those cars are all good cars, all have fun points, character etc. They are just not even close. I’ve done about 500 miles in a Lotus 7, backroads in New Zealand – that’s close. The looks. 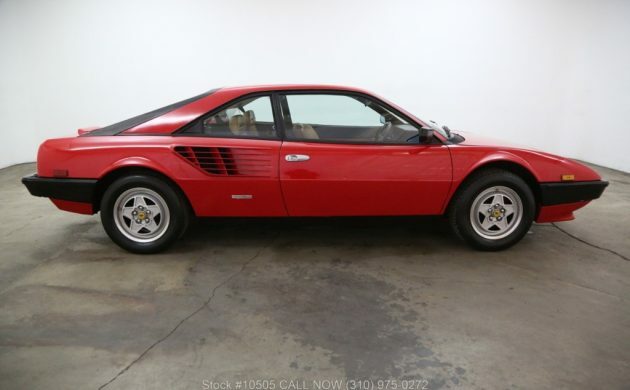 OK I know it is cliche, but an 70’s – 80’s Ferrari is SO different. The general public has this reaction, even Generation Z, or Millennials, or whatever – I don’t know how they instantly recognise a Mondial. I had a pack of 12 year old skateboarders ask me if it was a Dino. Not too far off. How do they know this stuff? I thought they were all glued to their phones dreaming of electric cars. Forget the Mondial in 2D, it’s been said before photo don’t do them justice and it’s true. 3D you will understand. TRUST in Leonardo Fioravanti, who also penned the 246, Daytona, Boxer, 308, F40, 288 GTO, and Testarossa. But never mind the public going gaga, it’s what it will do to you. I sit in it in the garage just for the smell. My wife was jarring preserves this evening, I stole a jar and snuck out to the garage to capture the cabin aroma so I could send it to an old car-nut buddy (just pm me if interested I have more 8-). The cliche, about a Ferrari being like mistress, it’s true. I’m completely obsessed with it. I grin like a besotted schoolboy looking out the window, waiting for the rain to stop. I went for a drive along some country roads last autumn and it’s a brilliant riotous thing. Stock suspension going bump thump, perfect wheel horse at centre writhing in communication over every road defect. It’s chuckable and stiff. Exhaust blearing all the way up to 7500 warning squirrels ahead, newly fallen leaves scattered in my wake..heaven.